A census of English households has taken place every 10 years since 1841 except for 1941.Because of the 100 year rule, the latest accessible census is 1911. 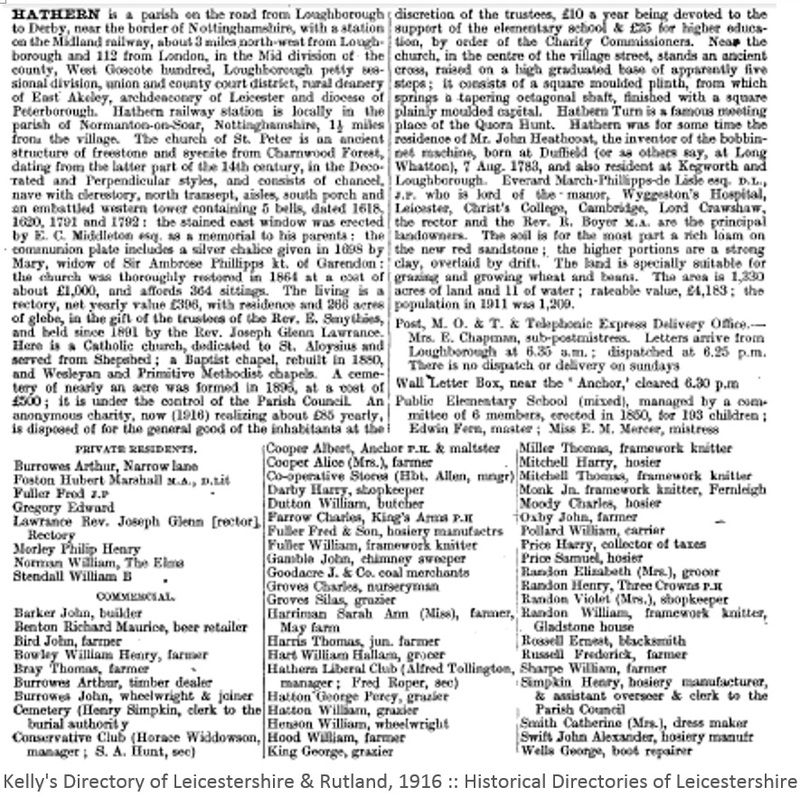 Information from these various sources has been collated to form a separate database for each Hathern census up to 1911. Unfortunately none of the census records contains a house number that can tie the house to a house still standing. But all is not bad news - the household records are always recorded in the same sequence, starting at the Turn and proceeding in an anticlockwise direction, with all except 1841 showing the street name and a sequence number within the schedule. Here you can find an surname index to all the census. Below you can link to the records and see an example of the original census schedules (1841 to 1911) or the original household return (1911). 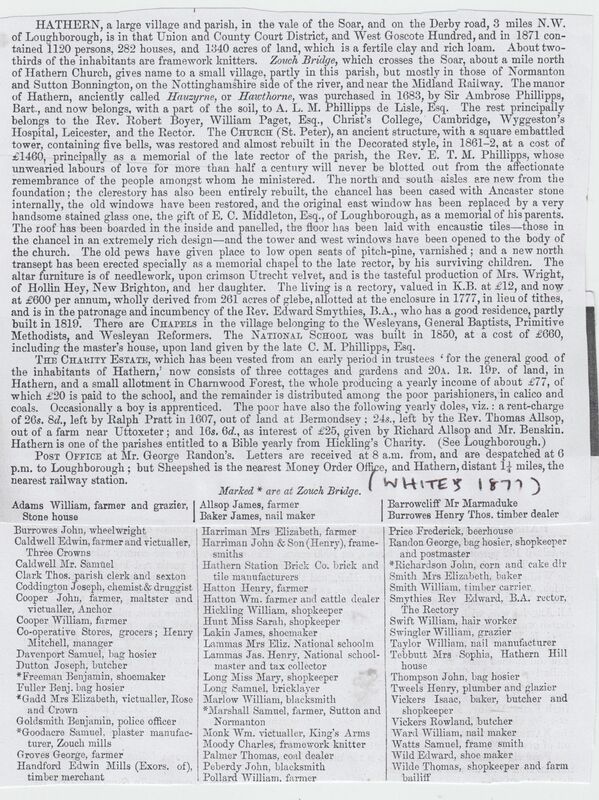 The picture above is of a group of stockingers taken about 1880 including James Mitchell who was first seen in the 1851 census aged 11 and already a framework knitter, living in Golden Square only 5 houses apart from his uncle Samuel's family. 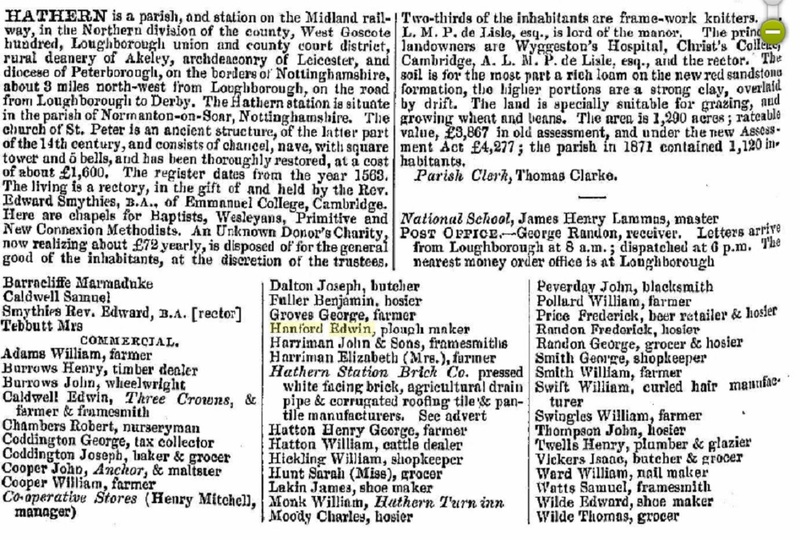 By 1861, James was married to Emma from Shepshed, about to have the first of their 8 children, who unusually for those times, all lived through to adulthood. By 1881 the family had moved to Cross Street, with 7 children at home - 3 teenagers already knitters and 3 younger children at school. The couple later moved to Gladstone Street where they were living in 1911 in a 5 bedroomed house with a grown-up son. James and his son were still working as framework knitters in silk - see James's census return in his own hand. The next release of real census data will be in 2021 (the 1921 census). The census records of 1931 were lost in a fire andno census was carried out in 1941. However in 1939 a Register was prepared for the start of war which contains similar details to the census. Follow the following links for the original 1939 register and the transcription of the 1939 register. The information is fairly basic. 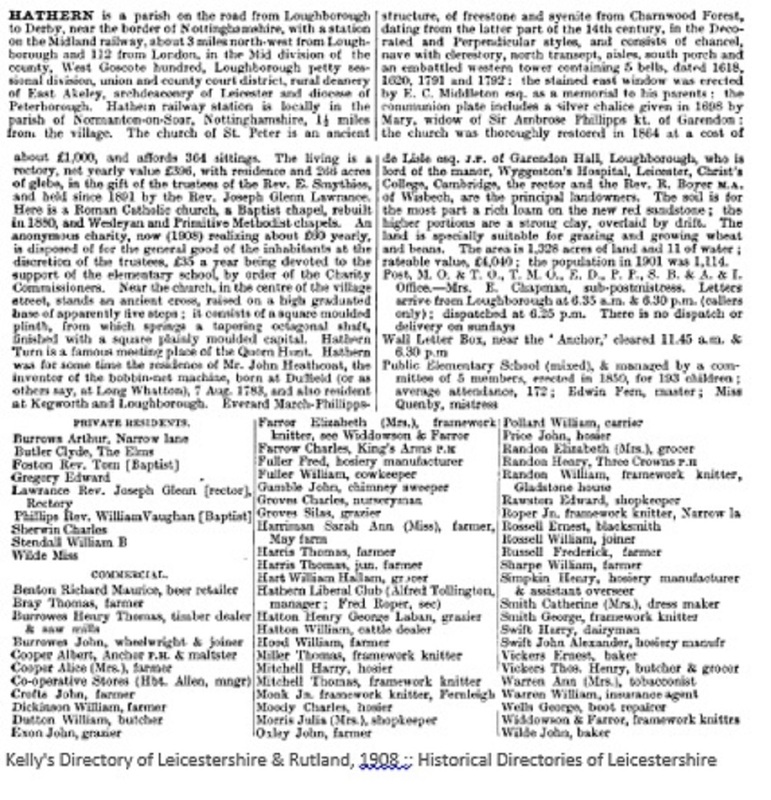 No streetname nor marital status is shown and the birthplace only shows whether the person was born in Leicestershire or another county. 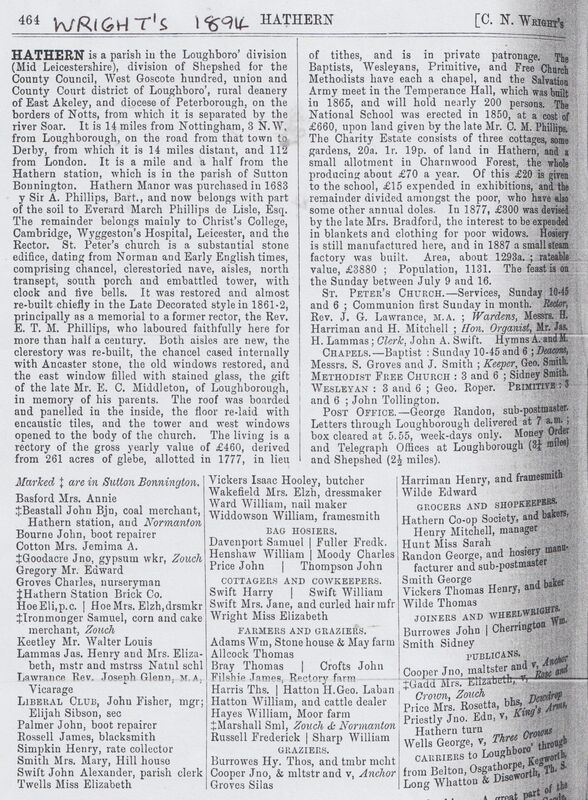 The enumerator was James Attenborrow, who is shown in the census for Hathern north, entry 54 with wife Alice. In the 2 enumeration disticts (north and south) there were 265 households and other buildings. Of these about 80% were born in Leics. Note the use of F.W.K. as the abbreviation for framework knitter. On this census only the ages of persons 15 and above were rounded down - e.g ages 15-19 were shown as 15, ages 20-24 were shown as 20.Editor's notes : (i) the "sch. no." given for each household has been added by me to purely for referencing puposes). (ii) the date of birth was not shown on the census schedule, it is derived from the age. In this census the usual big preponderance of farm workers and FWKs is shown but of extra interest is persons listed as "independent" means, for instance the rector, ETM Phillips and his 4 daughters with 5 servants, and ,nearby, Edward Vaughan, clergyman, with 4 other independent persons from Scotland and elsewhere along with 5 servants. Example of schedule. In the 2 enumeration disticts (north and south) there were 276 households and other buildings. Street names are shown along with the actual place where the person is born ; this information was required to answer one of the burning questions, the rate of migration from rural to urban areas. Hathern North starts at the Turn, then turns straight into Church Street (Wide Lane not yet named) then onto the Green with a small detour for the single residence in Pasture Lane, then again on Church Street to the Cross onto the Dovecote before finishing at 3 households in "House in the field". Hathern North starts at Tanners Lane, proceeds up the Dovecote to Derby Road (Wide Street not yet named) taking in Golden Square before finishing at the Dovecote and High Field. 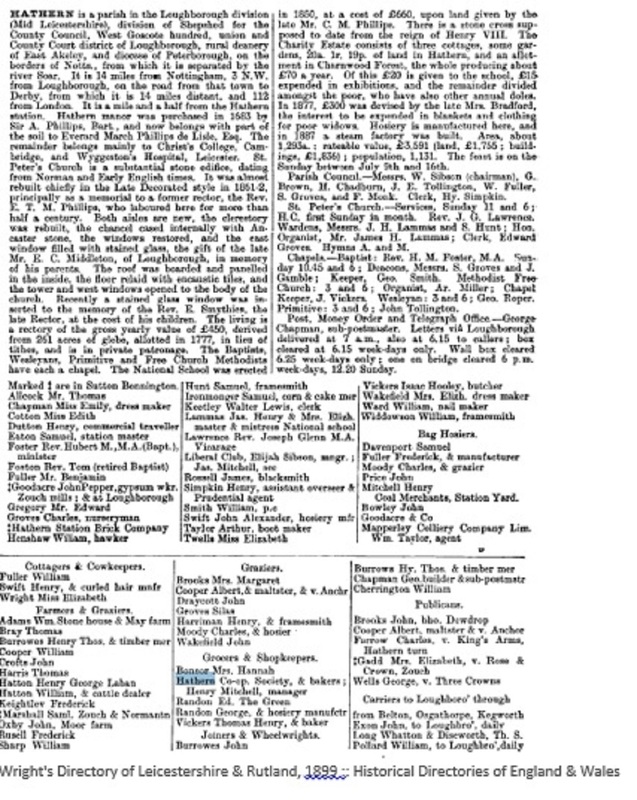 The 1851 census was the first to record each person's marital status and relationship to the head of the household. Each individual's exact age was also recorded (to the nearest year). Much greater detail was asked about people's occupations than in previous censuses. This enabled government analysis of occupations into "classes" and "sub-classes". 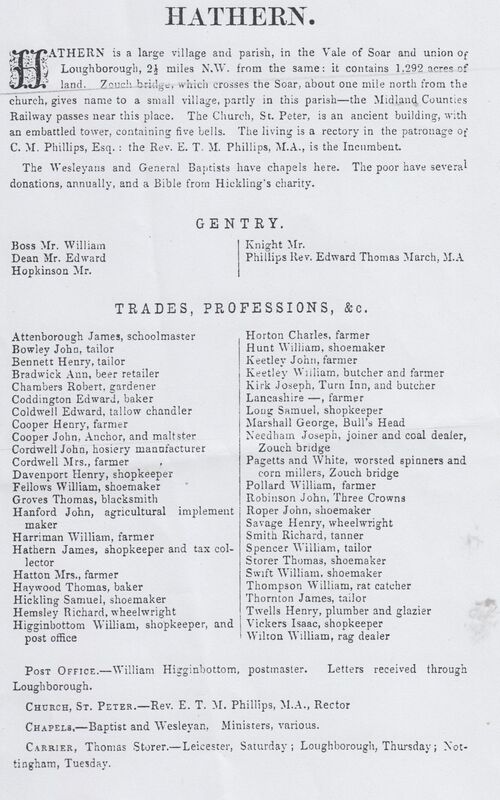 Masters in trade and manufacture were asked to state the word "master" after the description of their occupation and to state the number of men employed on the day of the census. 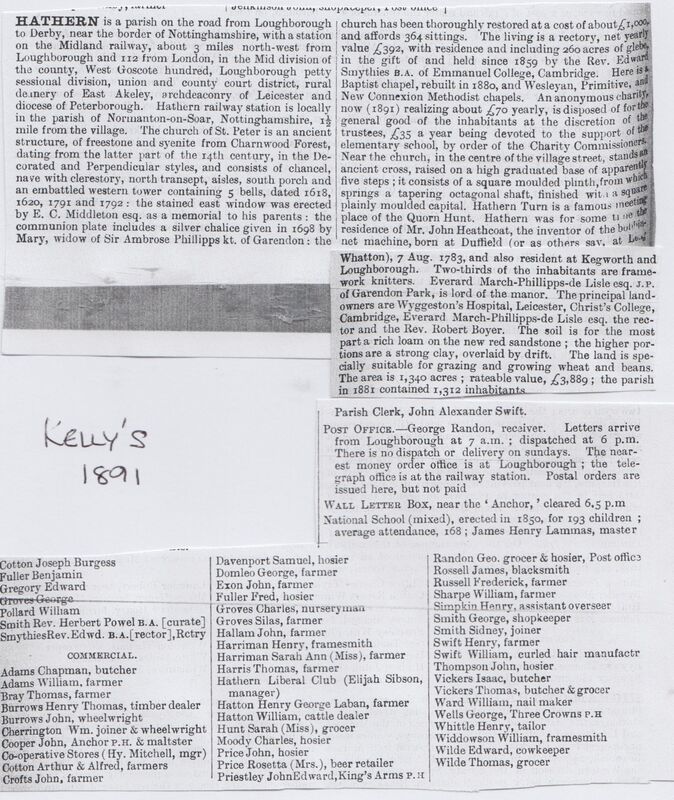 Hosiery workers dominate the census - in Golden Square alone, of the 130 workers, an amazing 114 were hosiery workers, spread equally amongst men and women and involving children as young as 9. Example of schedule. 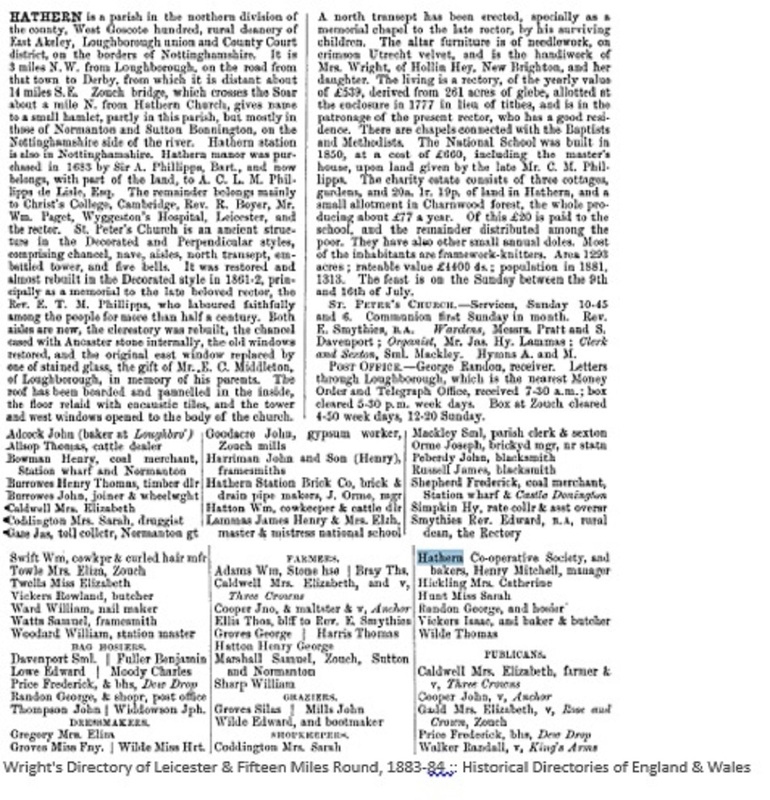 The 1861 format of the census was identical to the 1851 census, despite pressures for 'religious affiliation' questions to be included. This suggestion was rejected at the time. In the 2 enumeration districts there were 284 households and other buildings.Hathern North starts at the Turn (note the name "The Royal Arms") and continues down Wide Lane, past the 3 Crowns to Church Street, down Green Hill to the Green, Pasture Lane (now 2 houses) and into Cross Street, Narrow Lane, Dovecote Street and Wide Street, finishing at Hathern Hill (Lodge). Hathern South starts on Derby Road (Richard Christian, farmer and Lodge Keeper) and proceeds via the Leys to the Anchor Inn and Anchor Lane, down Wide Street to Tanners lane before moving back along Derby Road to Golden Square before finishing at the only 2 residences in Shepshed Road (Harriman's Field and Swingler's Field). 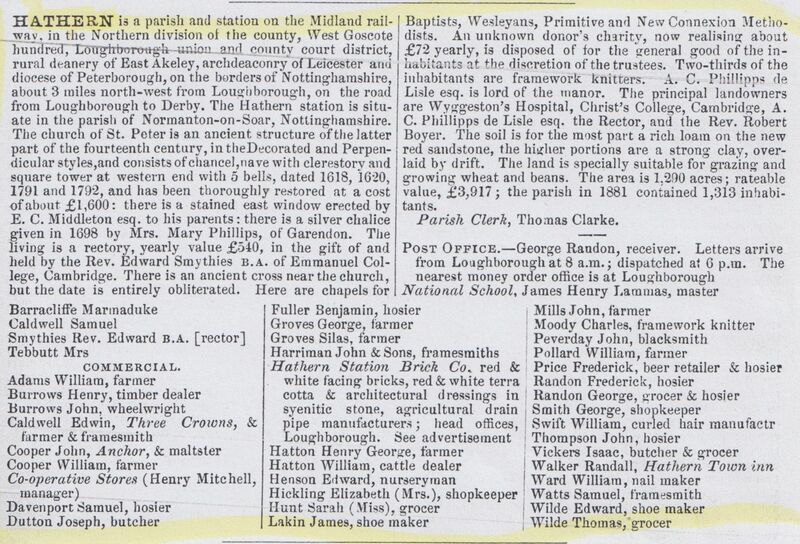 This is first census to show the National School and School House in Cross Street, the school having been established 10 years earlier. The resident headmaster John Barnacle is shown. Example of schedule. 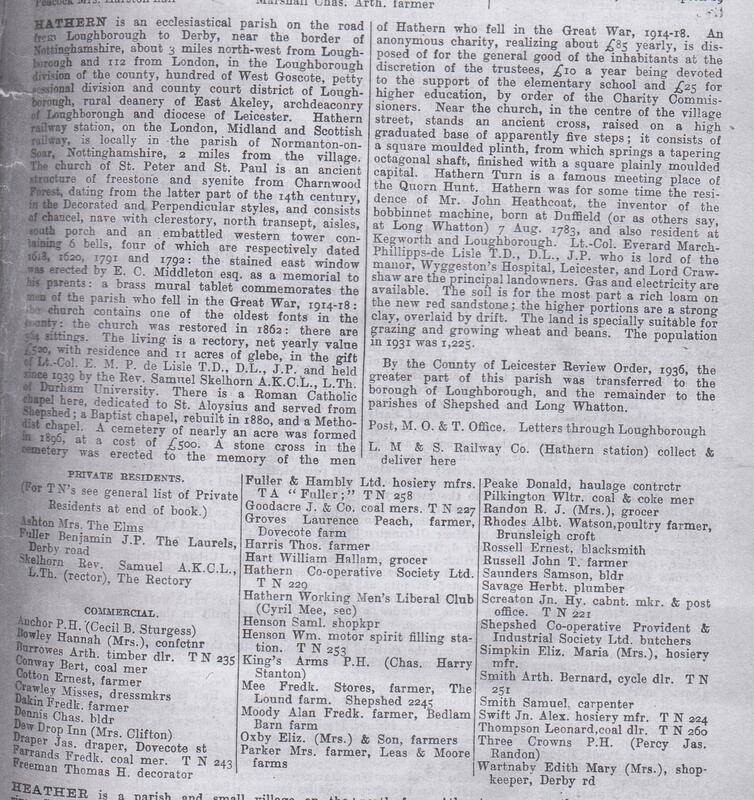 No change in information, although no street names were shown on Hathern South entries. In the 2 enumeration districts there are 292 households and other buildings. . Hathern North iss described as part of the parish which lies north of the road leading from Shepshed to Hathern including the eastern side from Narrow Lane to the Dovecote, Hathern Turn, Glebe Farm and Dawson's Lodge. 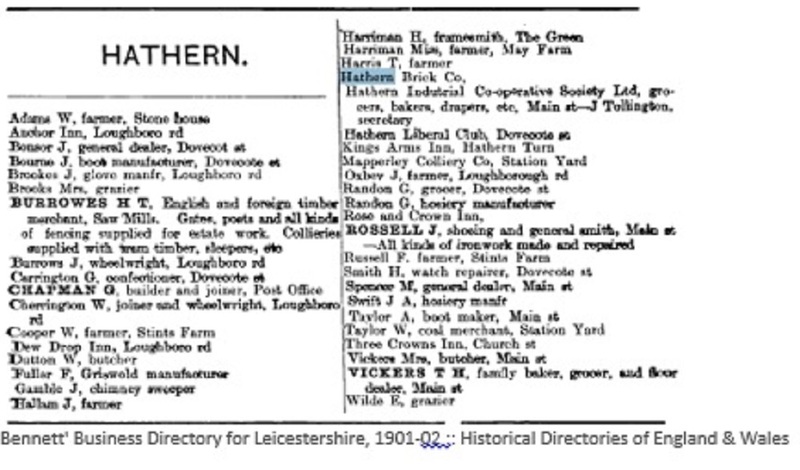 Hathern South is the remaining part which lies south of the road from Shepshed to Hathern including the Square to the Dovecote, Loughborough Road, Tanners Lane, Swingler's Barn and Harriman's Barn.For the first time scholars are identified - over 180 of them in the village. The schoolmaster is the much respected James H Lammas from Limehouse London then 29 living with his wife Elizabeth. Example of schedule. Additional information about occupation was recorded - whether the person was an employer, a worker or worked on own account. and whether the person was working from home. Other information collected (but not shown on transcription) was no. of rooms if less than 5. Also collected but not shown on the transcribed records here was disability (deaf and dumb, blind, lunatic or feeble minded). The whole village was now a single enumeration district with 265 actual households and approx. 30 uninhabited. The enumerator again was Henry Simpkin. Example of schedule. 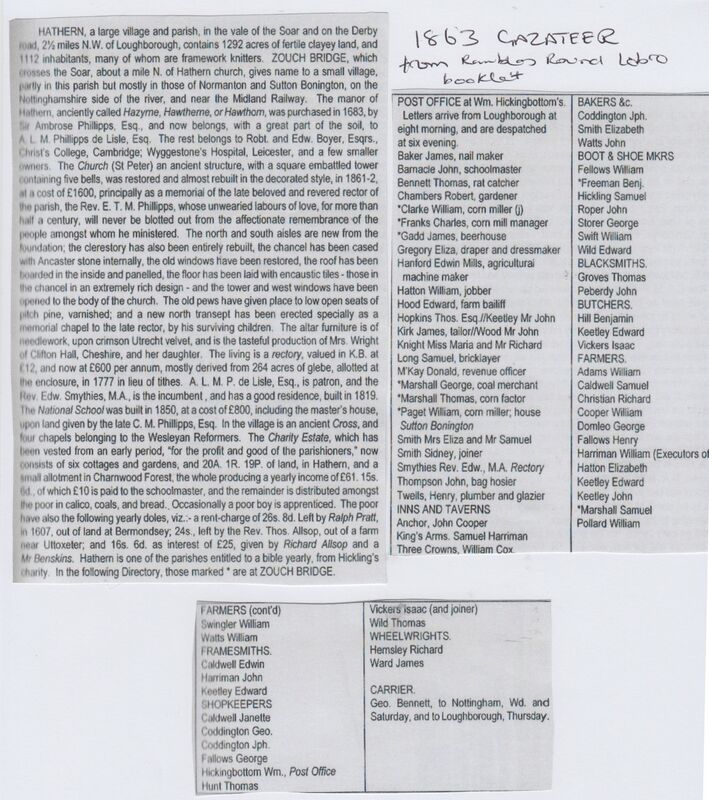 Extra information added is number of rooms, and the number of children in total and number still alive. By this stage occupations have become a lot more varied though a considerable number of people are still in hosiery. In Golden Square for example just less than half are occupied in hosiery. Quite a few work at the Hathern brickyard working with terra cotta, others at the Woodyard. The total number of households and buildings rose to 302. Example of household return. During the C19th, various publishers produced books every few years for each county, which included the geography and history of each town and village in the county, along with a list of the trades people. 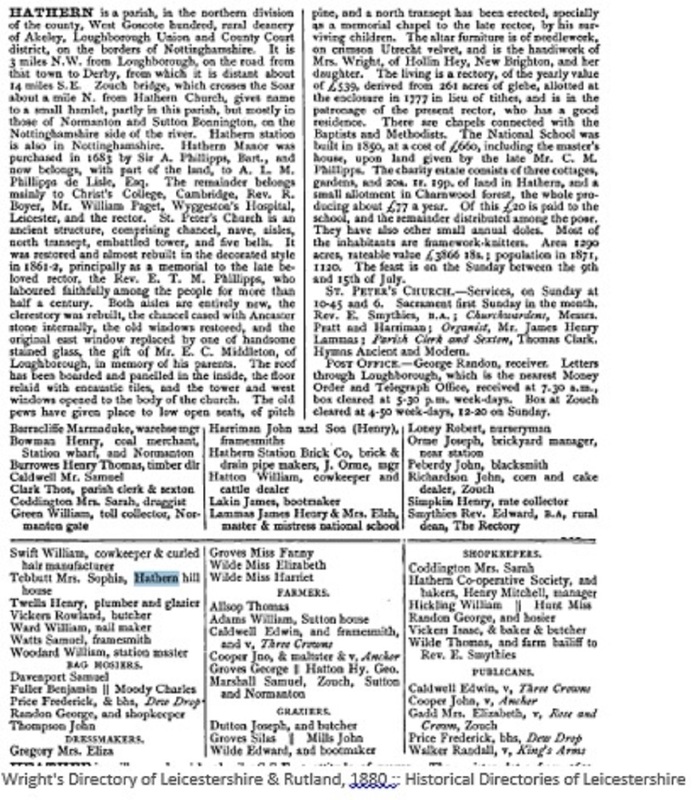 The various publications included Kelly's, Wright's, White's, Post Office and Bennett's. Picture is Henry Harriman's framesmith's factory on the Green mentioned in the 1894 Wright's gazetteer. The information provided is invaluable covering topics like the manorial connection, the parish church and village chapels, pubs, shopkeepers, farmers and tradesman, clubs and charities and population. From the residence menu at the top of this page you can see all the gazetteers already collected. There are more in the Records Office. 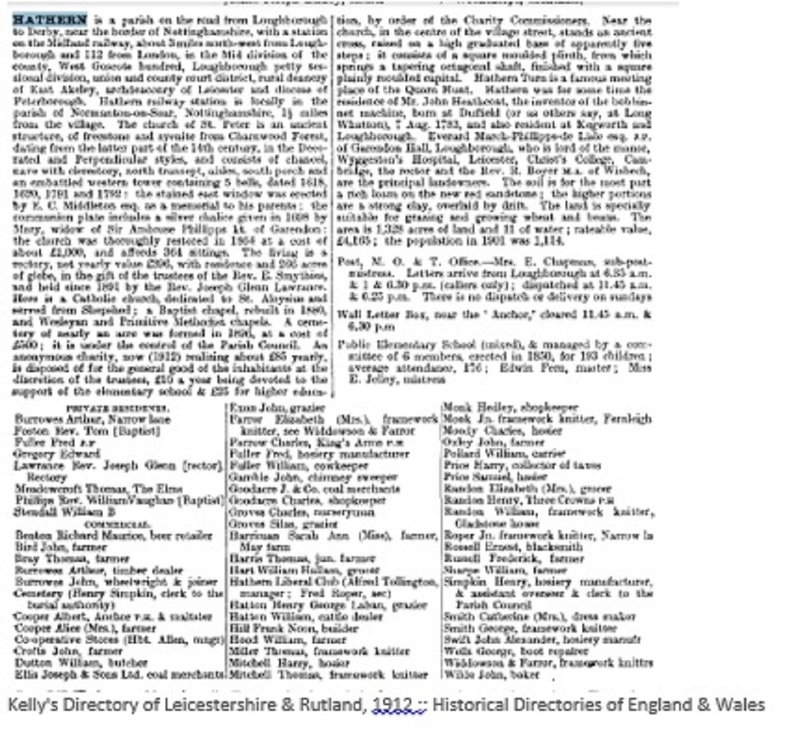 Electoral rolls have been a legal requirement since 1832, listing everyone who was eligible to vote in national and local elections, usually published annually. They give the name of the voter, their address and until 1948 what was their qualification to be on the list of voters. In the early days only a limited proportion of the (male) population were entitled to vote and thus only their names appear in the register, By the end of the first world war, 1918, nearly all men over the age of 21 had the right to vote. The vote was extended to all women over 30 in 1918, and finally in 1928 this was reduced to 21, in line with men. From the residence menu at the top of this page you can see all the rolls and directories already collected. There are more in the Records Office and on line which will be added shortly. 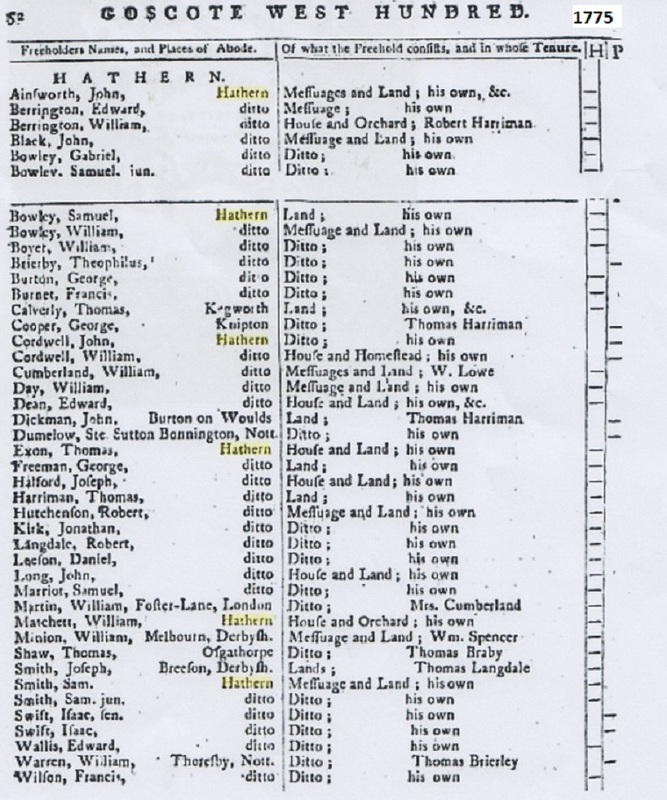 From the same residence menu and here you can also link to Farnham's Mediaeval Notes which includes some of the earliest lists of Hathern residents. The original Rates Valuation book fo the Parish of Hathern for 1824 was passed to the History Society by Mrs Sheila Swift in 2016 and has been transcribed :- IMPORTANT FIND.The associated estate map was found in the Records Office. This is invaluable as it enables us to establish where everyone lived precisely in 1824, 47 years after the Enclosure award. Full transcript, map and analysis.